The TSO Mobile's Blog: How are you using the latest technology? It is no secret that technology has revolutionized the way that business is conducted in today's world. With advances in communication and information technology, the aspects in operating a successful business are often reliant on the ability to share and receive information as quickly and efficiently as possible. One of the latest and most popular forms of continuously progressing technology is that of mobile devices and applications integrated within these devices. Within the fleet management industry, with the assistance of mobile technology and applications, fleet managers are able to operate their businesses on the go, while gaining significant benefits. With mobile integration of applications, fleet management offices are able to maximize productivity, improve communication, optimize scheduling, reduce costs, provide better customer service and improve the overall performance of a fleet. 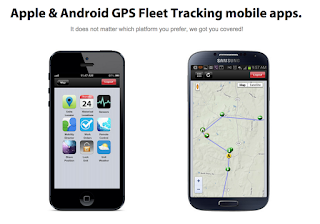 With GPS Fleet Tracking mobile apps, connected fleets can be listed on one single screen and provide real-time control about the whereabouts of vehicles. Increased productivity is achieved through an applications' ability to access and select any and all vehicles within a fleet. Through different map views, it is easy to see and schedule route navigations while receiving constantly updated information about current and historical locations. With the capability to manage vehicles from anywhere, work orders can even be placed and processed with the push of a button. GPS tracking of vehicles, giving exact locations and information, can then give agencies the power to communicate with riders about scheduling and timing. Because of a mobile applications' ease of use, communication between drivers and operators is also made more efficient. Real time chat and messaging capabilities are accomplished as different updates and statuses arise and need to be reported. Communication is instant, making solutions to problems or concerns easy and effective. The sharing of information then quickens the decision-making process in reducing costs of fleet performances when affected, such as tracking fuel usage. Mobile applications allow the most important tools of a GPS Fleet Tracking System to become accessible at the palm of your hand, at the touch of a screen. With mobile apps that integrate with GPS Fleet Tracking Systems such as those of TSO Mobile, fleet operators are able to access professional versions of web systems that lets them track vehicles and entire fleets on the go. It also serves to relay detailed, important information and historical activity concerning monitored fleets. The TSO Mobile "TSO Fleet Pro" GPS Fleet Tracking App may be downloaded from Google Play for Android phones and in the App Store for use on iPhones. Labels: Business Management, fleet tracking devices, GPS Fleet Tracking Company, Trolley, vehicle maintenance, vehicle tracking device.